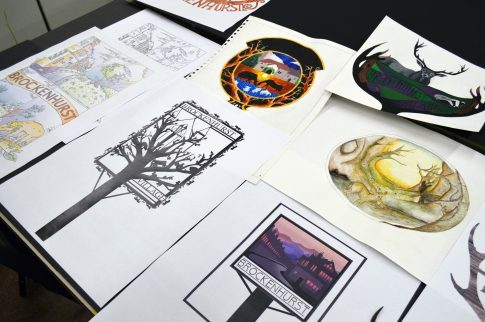 Ten designs by A Level Graphics students from Brockenhurst College have been selected for exhibition by Brockenhurst Parish Council in its competition for a village sign. The student designers have been invited to attend the Annual Parish Meeting on 24th April at 6.30pm at Brockenhurst Village Hall, where their designs will be shown to friends, families and local residents. Thirty-two entries from Brock students were submitted, along with entries from local schools and villagers, after the Council sought artistic input. The design brief said the sign had to represent the village, its location, and its history, but nonetheless encouraged designers to be creative. All entrants will have the opportunity to talk about their design influences and answer any questions at the meeting. Those in attendance will then vote for their favourite entry to make the shortlist from which the winning design will be chosen by councillors. The students who submitted designs due to be exhibited are: Amelie Ayers (two designs), Bethany Bromley, Charlie Ellis, Charlotte Petley, Hannah Denyer-Phillip, Jasmin Snell, Jodi Lang, Lucy Leclerc and Sam Webster.